With a man-to-man, conversational writing style, Chet Collins does just what his subtitle suggests: he offers practical guidance to any Catholic man for the transition from dating, to engagement, to the early months of marriage. While this short book seeks to answer primarily pragmatic questions, it offers answers that are faithfully rooted in the Church’s teachings on marriage and human sexuality. 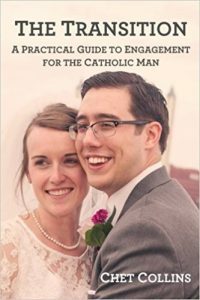 The Transition: A Practical Guide to Engagement for the Catholic Man reads like getting advice from a good friend who passes on insights and suggestions gleaned from his own recent experience of being engaged and married. In a culture where there is less handing down of wisdom from generation to generation, Collins meets an important need. The Transition offers something for any Catholic man; it can encourage the devout Catholic, as well as challenge the lukewarm Catholic who is open to advice and looking for direction. Although not a book on discerning marriage, there are a few elements that could strengthen or bring into question a man’s decision to marry a particular woman. With only 143 pages and an easy-to-read style, this book is realistic for the busy time of engagement. It is clearly intended for a male audience with its down-to-earth, straightforward, humorous, and relatable style. Content and method are united in Collins’ writing. The simple, five-chapter table of contents gives an accurate overview of the content of the book: proposing, preparing for marriage, planning your wedding, the wedding day, and the first six months of marriage. The second chapter, “Preparing for Marriage,” is the longest because, as the author stresses, it is the most important. This is a meatier chapter about laying some serious groundwork for a healthy and joyful marriage. The necessity of proactive, respectful, and honest communication is a golden thread. In an optimistic, yet realistic approach, Collins points out the importance of discussing during engagement four key areas of married life: 1) religion, 2) kids, 3) money, and 4) in-laws. The sometimes unnoticed, yet strong influence of our families of origin is also highlighted. There are a few pages devoted to a simple, accurate, and understandable presentation of the Church’s teachings on human sexuality (the ends of marriage, Natural Family Planning, contraception, cohabitation, etc. ); this is an invaluable “tangent” for Catholic young adults today. In the third chapter, Collins gives tips on picking venues and party planning. He points out that the requirement for Catholic weddings to be in a church actually simplifies wedding planning. This follows with another needed brief “tangent” on why Catholic weddings need to occur in a church. In general, Collins suggests that a man defer to his fiancée when it comes to wedding and reception planning, allowing her to lead that process, and protecting her vision from the potentially invasive opinions of others. However, one exception is the planning of the Nuptial Mass, in which he encourages active and intentional decisions on the part of the man. A manly, no-nonsense coverage of the bachelor party encourages men to make moral decisions as they have a good time with friends. Overall, he covers the most important aspects of planning the wedding and reception without going into unnecessary details, so that men have a sense of the intense planning period that will precede their wedding. The Transition could be improved with a second edition, since there are notable typos. Also, even though it is not an academic book, it would have been nice to have some citations on a few statements that are not common knowledge. In the end, these are small matters for this valuable book written by a man for a man. It would make an excellent gift to a man who is thinking about proposing or is already engaged. Brad Macke lives with his wife and two daughters in Indiana, where he teaches high school religion and serves as the campus minister. He received his Master’s degree in Theological Studies from the Pontifical John Paul II Institute in Washington, D.C.